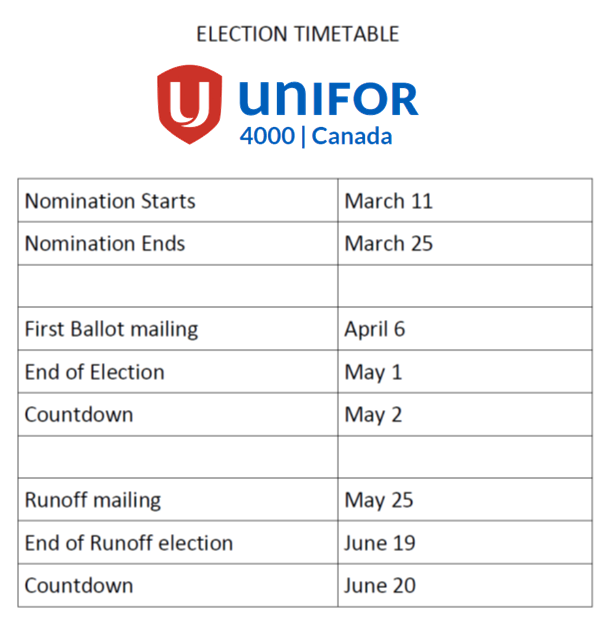 Nominations closed on Wednesday, March 25th for the upcoming elections for the full-time position of Secretary Treasurer and the 7 full-time positions of Regional Representatives for Unifor National Council 4000. We are pleased to report that Ron Shore, Regional Representative for Council 4000’s Mountain Region and Local 4001, and Dave Kissack, Regional Representative for the Council’s Prairie Region and Local 4002, have been re-elected by acclamation. Brother Shore was first elected in 2009 and acclaimed in 2012. Brother Kissack was also first elected in 2009, and won the subsequent election in 2012. Their new three year terms start on July 1, 2015. We congratulate both and wish them well in their future endeavours. The experience they bring to their positions is an asset to our membership. The three year term for the position of Secretary Treasurer does not end until the end of 2016, but present incumbent Heather Grant has decided to retire from VIA Rail, and consequently her position as Secretary Treasurer of Council 4000, a job she has held since 2007. Prior to that, Sister Grant was the Regional Representative for the Council’s Atlantic Region and Local 4005. That is the cause for the election of Secretary Treasurer. The term for the newly elected Secretary Treasurer will be from July 1, 2015 to the end of 2016, at which time nominations will be opened at the National Council 4000 Convention in October 2016 for both the Secretary Treasurer position and National Council President. More on Heather Grant’s departure in the weeks ahead. There are a number of members who have been nominated and are running for positions. We will be posting more information on the candidates and their campaign brochures as they begin to provide this information. Ballots were mailed April 2 and must be returned on or before May 1st. If necessary, a second round of voting will begin on May 25.